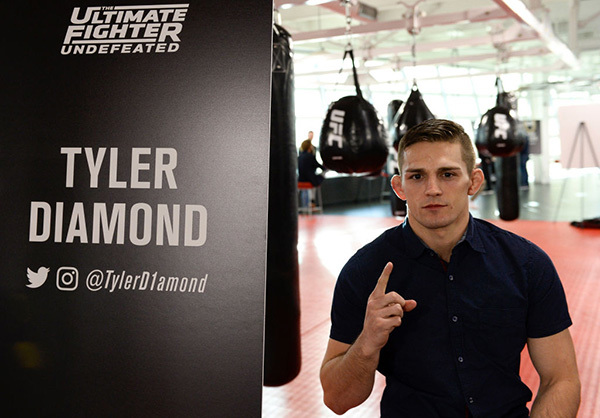 As the first overall pick of Daniel Cormier on The Ultimate Fighter: Undefeated, Tyler Diamond understandably had a target painted on his back from the first day of the competition. But the way the 27-year-old sees it, it was there a bit longer than that. Whether Cormier’s faith in the Californian is rewarded remains to be seen, but even before the show, there was a buzz about Diamond, a Team Alpha Male squad member who has put together a 9-0 record in a pro career that began in 2015. Given that record, his talent, and his team, you might assume that a UFC call was already on the way before TUF came up. Diamond assumed the same thing, and after his submission win over Emilio Chavez last November, he was hoping that his time had come. Now he gets to control his own destiny, with his performances on TUF the sole determinant of whether he gets to the UFC or not. It’s the beauty of the show, and it rescues Diamond and his fellow competitors from the Wild Wild West of the regional MMA scene, where there is no linear path to the Octagon. TUF is Diamond’s opportunity, and he knew it from the start. So the inconvenience of being away from the outside world for six weeks was no issue. If Diamond sounds like a young man on a mission and with his priorities in order, that would be accurate. Then again, that’s usually the case for the graduates from Team Alpha Male. Now it’s time to fight.